In honor of today’s military-minded holiday, here’s a card featuring a player who served (stateside, I believe) in the U.S. Army during the Vietnam War. The card also happens to have been one of my favorites when I was kid, a great action shot of a guy who seems with his balance and his powerful legs and his rubbery upper body to have been made to be that poised human whipcrack known as a major league pitcher. From the position of his wrist it looks like Koosman’s about to snap off a 12-to-6 curveball. I don’t know what pitches Koosman threw, actually, but I know he was good at throwing them, helping the Mets to two pennants and one World Series. Two years before this card he won 21 games and finished second in the National League Cy Young voting. The following year, when this photo was snapped, he went 8 and 20. But here he is, in the midst of that dismally unlucky season, showing perfect balance. Can you stay balanced during the bad times? I guess that’s the key. Koosman could. The year of this card he had another lousy won-loss record, 3-15, which dropped his all-time record with the Mets to just three games over .500, and the Mets traded him away in a move that reduced the number of members of the 1969 Miracle team remaining on the squad to one, the invincible Ed Kranepool. The Mets had been floundering since Tom Seaver had been jettisoned the year before, but the trade of Koosman truly closed the book on the Mets’ first golden age while, in a pleasing twist, opening the door just a crack for their next golden age. Koosman had recorded the final out of the Mets’ first World Series win, and the minor leaguer he was traded for, Jesse Orosco, would record the final out of their second World Series win. But Orosco, who would become a very important figure to me—the last strand of childhood—for being the last Cardboard God to hang up his major league spikes, is a story for another day. 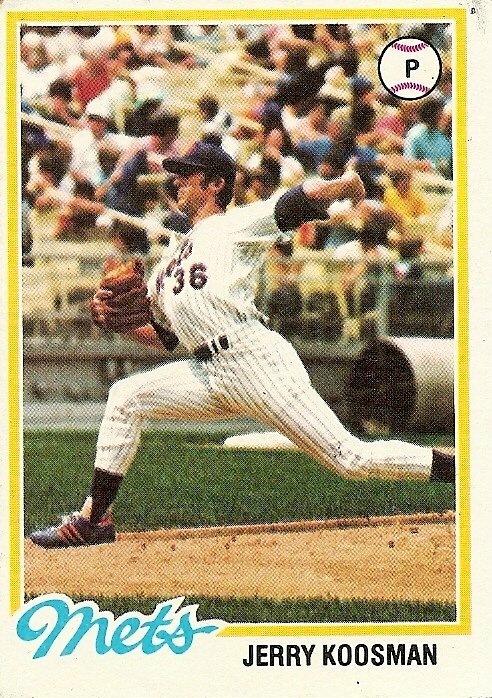 Today I want to just do some holiday blabbing about Jerry Koosman, who kept his balance through the last couple unlucky years with the Mets and was able to stick around long enough for the wins to start coming back to him on the Twins, winning 20 games his first season with them and 16 the next. He dropped off the following year, and the Twins dumped him for Randy Johnson, who unfortunately for the Twins was not Randy Johnson. Koosman soldiered on, winning 11 games both of the next two years, the latter effort helping the White Sox post the best record in the major leagues in 1983. He hung it up two seasons later with 222 lifetime wins. A consideration of Koosman’s estimable career, combined with thoughts sparked by the thought-sparking saint of baseball blogdom, Joe Posnanski, who a few days ago wondered who was the best everyday player the Mets have ever had, has inspired a new, hopefully recurring, feature here on Cardboard Gods in which I will ask readers to chime in with their picks for the all-time best team for every franchise. (I’m certainly not the first to ever think of fooling around with this idea; the great Rob Neyer riffed on the idea in producing one of the most entertaining baseball books ever written, The Big Book of Baseball Lineups.) I decided to start with the Mets, figuring that their fans could use an opportunity to dwell on the good times in the past, what with the present fortunes of the team looking so gloomy, losses mounting, the guillotine seemingly inches from the neck of the cornered manager. I decided, to keep things relatively lean and mean, to not do 25-man rosters, but instead to pick 12 guys: a starting eight, a right-handed and a left-handed starting pitcher, a relief ace, and a wild card, which is basically a spot reserved for a player who doesn’t quite fit anywhere else but who you couldn’t bear seeing left off the franchise all-time team. I’ll get things started with my own picks. I had a lot of tough calls, so I’ll be very interested to see what other people come up with for their lists. Please feel free to provide honorable mentions. You are currently browsing the archives for the Jerry Koosman category.